Motorcycle Laws in Illinois | Hupy and Abraham, S.C.
Illinois, like other states, has laws that regulate how motorcyclists and other motorists should operate their vehicles on public roads. As a rider, it is important to know about these laws for two reasons. First, it is important so that you can comply with them and stay safe. Second, it is important because if a law is not followed, then that could be relevant to liability in an accident case if you’ve been injured. Illinois motorcyclists are required to follow all of the rules of the roads that apply to other motorists. This includes obeying the speed limit, following signs, and driving while sober. Using headlights during the day. Wearing eye protection or having a windscreen on your bike. Using a bike with handgrips below the height of your head. Having a passenger seat and footrest if there is a passenger on your bike. Allowing a rider to proceed with caution through an intersection after 120 seconds if the automated signal system does not recognize a motorcycle. This does not apply in a municipality with more than two million people. Prohibiting riders from riding on one wheel. This may be considered a form of reckless driving. Requiring riders to have a motorcycle endorsement from Illinois or another state. Requiring riders to carry minimum insurance coverage as required by law. Illinois does not have a law that requires helmet use for riders of any age. Instead, the decision about whether to wear a helmet is one of personal safety that each rider must make independently. The information above is just a sampling of Illinois motorcycle laws. Additional laws apply for riders who are operating a motorcycle on public roads and off road. 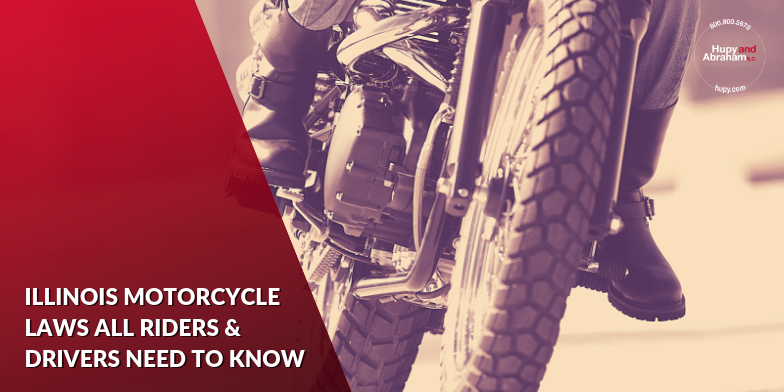 Laws change frequently, and it is essential to stay up to date on any new developments that could be important to you as a rider. We encourage you to monitor the Illinois Department of Transportation website to learn of any changes and to check our website regularly for more tips and resources for riders. You may have done everything right. You followed all of Illinois’ motorcycle laws—but you were still involved in a serious motorcycle crash. Often, motorcycle accidents are caused by negligent car or truck drivers rather than motorcyclists. Car and truck drivers may be distracted, drowsy, drunk, or they may simply forget to watch for riders on the road. Any of these things can result in devastating crashes. While the crash wasn’t your fault, you may be the one left to suffer from a serious injury such as a spinal cord injury, brain injury, broken bone, road rash, amputation, or another injury. You may also be the one who is able to recover damages for your injuries. Your financial recovery could include compensation for past and future medical expenses, lost income, out-of-pocket costs, pain, suffering, and other damages. If you feel that you were hurt because of another motorist who violated a state law or was otherwise negligent, then it is important to bring that to the attention of your motorcycle accident lawyer. Our experienced attorneys are also riders, and we will fight hard for your fair and just recovery of damages after an Illinois motorcycle crash. Call us, text us, or contact us via this website any time to schedule a free consultation and to begin learning more about your rights and potential recovery. Our personal injury law firm is here when you need us. Contact us anytimeâ€”24//7/365â€”by phone, online chat, or through our online contact form to schedule a free, no-obligation consultation today.